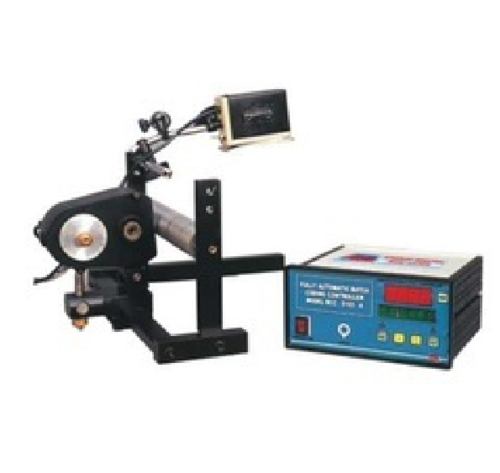 Motorized Double On-line Pipe Coder Model PPC – 35 + Double – O is a compact, fully automatic PLC based printer for 1 to 4 lines printing of ISI mark, Mfg. Dt., Company Name, Logos, etc. on all types of rigid or soft type PVC / Polyethylene / HDPE / PV pipes tubes, etc. of diameter 20 mm to 200 mm during extrusion process. This coder has Two individual Print-Wheels with motors where you can have Company Name Batch No. separately in 2 colours the repeat of both Print-Wheels is individually settable. The message to be printed is very easily composed by just sticking the low-cost rubber / nylon stereos (easily changeable) on to the print wheel. The inking is in the form of rechargeable cartridge, so colour of printing can be changed easily by changing cartridge. The PLC has a bright LED display to set the printing repeat from 0.5 Meter to 25 Meters. It also displays the length of pipe extruded, no. of prints that have taken place the linear speed of extrusion in meters / min. Also, a production length can be set it can give an alarm relay signal after the preset length of pipe has been extruded. (Free accessories include 1 Lit. Blue Ink, 1 Lit. Solvent, 6 mm Flat Rubber Character Set, Double Sided Tape Ink Cartridge). These coders are ideal for Automatic On-Line Coding on various types of tubes pipes during their extrusion process or as off-line printers also for manual printing. Flat rubber / nylon stereos.